Which Direction are Interest Rates Going? Which direction are interest rates going? This is a common question that is asked in the finance department at Hall and Hall. While it is very difficult to predict the direction that interest rates will be moving, we do know that long term fixed rates are still very attractive. 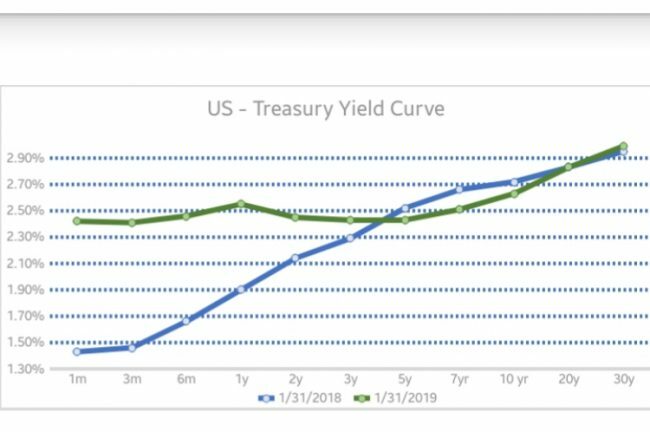 The chart above compares the US – Treasury Interest Rates from January 31, 2018 with the same rates from January 31, 2019. It is evident that short-term interest rates have moved significantly higher, while long-term interest rates have stayed moderately even. At Hall and Hall we are unique in that we have access to a variety of capital sources so we can match the borrower with the best possible loan product and interest rate. We take pride in quick loan processing and a long-term commitment to our customers. We specialize in land loans and our comprehensive knowledge of farms, ranches, and recreational properties allows us to best customize a product to fit your needs. Whether you are looking to refinance an existing loan, purchase a property, add to existing holdings or simply free up some capital for other projects, please contact a Hall and Hall financial representative today.